"Columbus was founded in 1891 as a U.S./Mexico border station but eventually coalesced around the railroad station three miles to the north in 1903. The area's history is tied to a March 9, 1916, raid on Columbus by Mexican revolutionary leader Francisco "Pancho" Villa. President Woodrow Wilson dispatched General John J. Pershing and 10,000 troops into Mexico to pursue Villa. This punitive expedition ultimately failed." 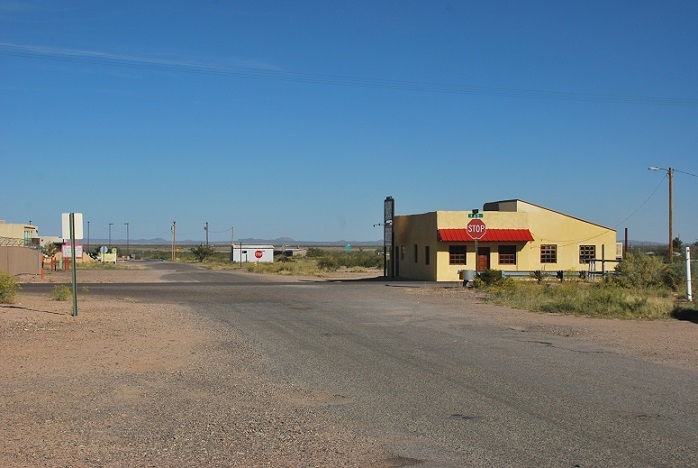 According to the aforementioned inscription on the Official Scenic Historic Marker for Columbus, New Mexico it would seem that the desert town's history knows a thing or two about regrets. Local poet and writer Gordon Taylor also writes of regrets. That we were both letting go. How can I push the time back to yesterday? Here is a reminder, there is another. A quaint look and a slow mischievous smile are in my dreams often. However, wishes won't make it so. Gordon Taylor is retired from a large communications company. His creative juices started flowing when he assumed the position of writer, compiler, and editor of the company's regional newsletter for which he received many accolades. Gordon has been strongly motivated by positive feedback from others for his poems, short stories and flash fiction. Gordon also does wonderful photography of the desert surrounding his home. We met Gordon — a member of the Deming Writing Group — outside the public library/bookstore in Columbus, New Mexico. The library also has a few of the anthologies that Gordon appears in on its shelves, notably, Naked Came the Javelina and Down Under Deming. Regrets appears here with the author's permission.